Friends, I am incredibly excited to announce -- at long last -- the first ever full-sized Sam and Fuzzy book! This 368-page monster collects the entirety of Sam and Fuzzy Fix Your Problem, and is being published by our friends at Topatoco. With your support, this sucker will become the first in a series of print editions that will (eventually!) house every single Sam and Fuzzy strip ever published online. Woo! 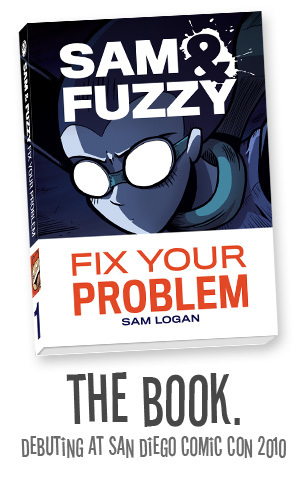 Sam and Fuzzy Fix Your Problem will be debuting at this year's San Diego Comic-Con. It'll be available at the Topatoco booth, and also at the book release party Topatoco is throwing for myself and Jeff (who will be launching the first Overcompensating collection). And of course, it'll also be available to buy online. I'll have more details later in the month. But for now... excitement! Good news, everyone! It took a lot of patience and dedication, but after weeks of grueling labour, I finally, finally... got all the stars in Mario Galaxy 2. I got them for you! No need to thank me. Speaking of which... man, is July really already almost here? Terrifying! But also exciting, because July is going to be a big, big month for Sam and Fuzzy! San Diego Comic-con is coming, and so is a hefty new slice of S 'n F swag... the first in a series of items that you've all been demanding for years now. (Uh, sorry it took so long.) More news soon!